A few simple steps and a great WordPress plugin that will automatically build a sitemap for your blog and notify Google of all your new posts. This is one of the more important steps involved when setting up your new WordPress blog if you want organic search engine traffic. First install the latest Google XML Sitemap Generator plugin for WordPress and follow the installation instructions. The plugin needs write access to your blog directory so make the blog folder writable (CMOD 666 or 777). 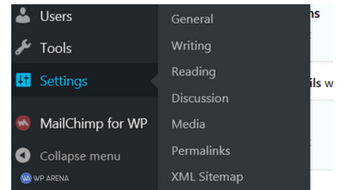 After activating the plugin you will now have a new Sitemap sub-menu under your settings menu in the WordPress dashboard. Click the Sitemap link and to begin setting up this plugin. The plugin is self-explanatory. I left all the defaults that was enabled. Having a sitemap is very important for SEO. Consider the sitemap the thing that runs in the background that you never had to edit once set up. Well if the plugin has an update, then update the plugin and read the changelog for any changes made. After your sitemap is built go over to Google Search Console and login or create an account. Now here is where to pay attention OK? You can add your main domain/website and your blog at Google but make sure you add them both. If your WordPress blog is in a directory within your website, submit the blog as another website. If your whole website is run by WordPress then add just the main domain. If your blog is part of your website then add the blogs URL as a website in Google Webmaster Tools. After you add your website and or blog to Google then submit your sitemap for that URL. https://wparena.com/sitemap_index.xml. For great SEO tips to consider, check out our guide on Unbeatable SEO Tips To Boost WordPress Rankings.